In a business climate where customer support is often considered a cost center, we’ve seen firsthand that investing in real-time support actually drives revenue and customer satisfaction. It does, however, come with its fair share of operational challenges. As discussed in our original post on this subject, we’ve seen that new customers were 30% more likely to start a trial on the back of a swift first response from our support team. We witnessed consistent CSAT responses to real-time chat experiences we provided using Intercom’s Business Messenger and Articles. We sat in meetings with Intercom leaders whose intrigue in the experiment grew as we saw the revenue potential of real-time support, and we had the joy of supporting, along with a stellar Management and Operations Team, the great people that helped us scale this experiment from 50% of our new customers to 100% in less than 6 months. Offering real-time support at scale and online to thousands of customers is hard. The pushback from a team concerned about the logistical challenges is real, the new operational requirements can be daunting, and traditional support tools will limit your ability to launch. The good news is, we did it and you can too – just keep the lessons that follow in mind and you’ll be able to jumpstart your process while (hopefully) avoiding our mistakes. With cupcakes in mind, we started small and began by defining two key metrics: first response time and subsequent response time (how long it would take us to follow up after that first response.) For the former, we settled on a benchmark of 2 minutes. We debated a 5-minute vs a 2-minute subsequent response time, but decided to forgo an official goal – instead focusing on great expectation setting around what follow up would look like. Up next: deciding who should receive real-time support. We landed on 50% of new customers and needed to figure out how many support reps it would take to handle these conversations. Our reps handle 4-7 conversations at a time in a normal inbox, but how would that number translate in a real-time situation? In this scenario, starting small meant starting conservative, and we assumed that someone would operate at 60% efficiency compared to a normal inbox. From there came the rollout. We recruited tenured top performers with an interest in experimentation and budding leadership abilities to help us work out our blind spots and roll the experiment out to the larger team. These Project Leads were our earliest advocates and instrumental in helping us identify the right workflows, scheduling systems and so many other crucial drivers of success. There was little time to celebrate after the initial rollout of the inbox. The early business results were very promising, but we had to get our operation tight enough to rollout this level of support to all of our new customers. We knew the difference between 3-4 conversations per hour and 6-8 was significant and would require a serious amount of operational growth. There were four ingredients for operational success: scheduling, tools, workflows, and communication and feedback. Staffing the real-time inbox was and continues to be the most challenging part of our workflow. Getting this right requires accurate data, smart forecasting and scheduling pros, all working together to ensure we have the right number of people in the inbox at any given time. We built a live heatmap of conversation volume and staffed it accordingly with primary and backup shifts. The latter was an “on-call” role just in case a shift was busier than planned. We also identified volume “hotspots” like 17:00 GMT when most of Europe and North America are online. 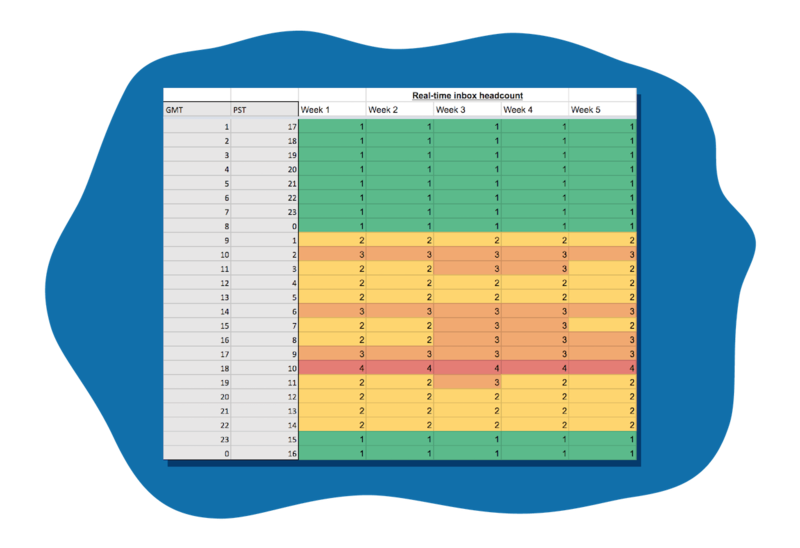 We initially used Google Sheets to do our scheduling (not really its designed use case, I imagine), but have since moved to a dedicated scheduling tool called RotaCloud. Despite 6+ months of tweaking, we’re still working hard to improve our scheduling – and continue to iterate and experiment on the right volume of shifts in a row, day and week for our team based on conversation trends. Intercom’s tools were critical to our success. The Messenger and our help desk, Inbox, allowed us to build a dedicated inbox for our real-time customers, move quickly between customers, create a tangible sense of a real-time conversation and throw in our favorite emojis and gifs, keeping things personal, true to our mission. Inbox saved replies and the Articles knowledge base also allowed our team to save time in providing answers to frequently asked questions in a seamless and swift way. After establishing a dedicated inbox for the customers receiving real-time support, we needed to build processes that allowed the team to easily transition between the normal and the real-time inboxes as they switched shifts. That transition turned out to be challenging, because the pace of conversation is much faster in real time. Context switching between inboxes and identifying who was best to take ownership of the conversation post-real-time shift required us to rethink our traditional workflows. Encouraging more liberal passing to the technical escalation inbox and having reps more clearly set customer expectations around non-real-time subsequent response times turned out to be small changes with big impact. When thinking about handling ongoing conversations at the end of a real-time inbox shift, we initially encouraged reps to pass any unresolved real-time conversations back to the inbox, leaving a note with some context for the next person on the next shift to pick up. We wanted to provide an end-to-end real-time experience for our customers, so this seemed like the logical workflow. We were wrong! Not only did the new person hopping into the inbox have to re-read the note (and often, the entire conversation) to get context, but they had to do this while also providing real-time support to any new conversations that came in. The volume could quickly become overwhelming as hours of “pass-back” conversations stacked up. By pivoting away from this “pass-back” system and to 100% ownership, we prevented a glut of pass-back volume from overwhelming the new shift. In addition, we allowed reps to operate as they would in a normal inbox – any conversations you took during your shift were yours to see to completion. Communication around shifts and gathering feedback were mission critical to running and evolving the project. 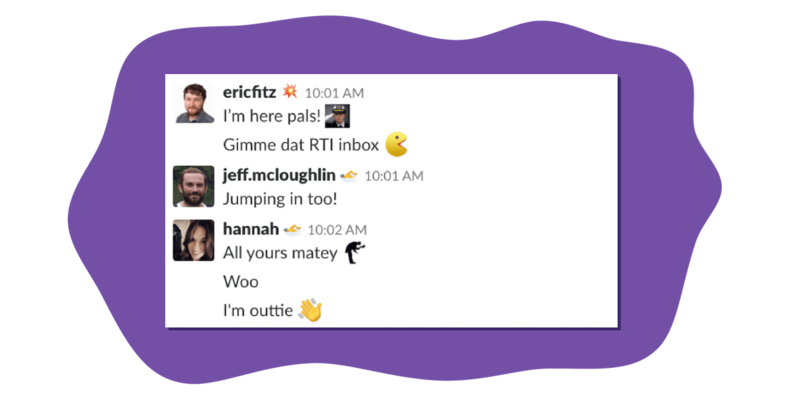 Our team launched a Slack channel to communicate handovers between shifts and ownership of conversations during a shift. Things like, “I’ve got so and so, @ryan can you grab so and so” and “about to sign off for my shift, @kaitlin are you ready to rock?”. This also included, “I need to tap out for a snack break, can you jump in?”. Although it may seem like a lot of back and forth, these are critical updates for the success of the experiment and the happiness of our team – with a target first response time of under 2 minutes, there was little room for error. Keeping the lines of communication open between the people working the inbox and the people managing the rollout of real-time support was crucial. This was a big change for our team, so gathering feedback was necessary to see how people were handling the change, but also to hear the brilliant ideas the people actually operating the real-time inbox came up with. A key example was how we refined our qualification criteria. Our reps flagged that we were providing real-time support to customers who had multiple apps, one of which was brand new and in a trial and one of which was activated and had been with us for many months. This didn’t exactly fit the “new customer” group; they’d already found success with Intercom. In addition, their questions were far more complex and often couldn’t be effectively handled in a real-time capacity as a simple “how do I do X?” question could be. After a careful evaluation, we adjusted the real-time qualification criteria to remove those “new” customers with previously activated apps. This got those customers in front of a support rep who could best support their needs and kept the focus of the real-time inbox on brand new customers and questions. It’s important to note that we cared deeply about how this experiment would affect the morale and productivity of our Support team and knew it would have a meaningful impact on the outcome. Without their buy-in, hard work and enthusiasm for the results, we wouldn’t have been able to successfully roll this out. The experience for them was exhilarating, motivating and on some days, tough – real-time support is not for the faint of heart. But when you’re on a roll in real-time and you’re seeing ? reactions from customers pop up en masse, as well as messages of gratitude for the quick response, it’s exciting and feels great! It drives a real sense of impact and utility. That being said, it’s fast paced and requires immense focus. We do our best ensure scheduling is done in such a way that our team is able to jump in and out and only spend a portion of their time supporting customers in real time to keep a healthy balance. Above all, operating real-time support comes down to starting small and learning quickly through open feedback loops and insights from your team. Operationally it can present many challenges, but nothing that can’t be overcome or outweigh the potential revenue wins for your business. Smart scheduling, tools, workflows and communication can jumpstart the process and help you avoid our pitfalls. As the old adage goes, learning from the mistakes of others is one of the wisest things you can do.